This lovingly maintained townhouse is one of only three with the largest floorplan in the resort. Upstairs there are 3 full size bedrooms, 2 bathrooms and a covered north facing balcony accessible from 2 of the bedrooms. The main bedroom has an ensuite and is furnished with a king size bed and an LCD TV & Blue Ray DVD player. The remaining bedrooms each contain 2 long single beds which can be joined to form king size beds. A spa bath is located in the main bathroom. Downstairs is a spacious, comfortably furnished open plan lounge/dining/kitchen area, 3rd bathroom and a covered outdoor entertaining area which is equipped with stainless steel gas BBQ and outdoor table setting. The single garage includes the laundry area. There is internal access to the townhouse from the garage and remote control garage opening. The courtyard contains a heated plunge pool with jet spas. Access is available to all of the resort facilities including an island lagoon swimming pool, children's wading areas, 2 heated spas, heated lap pool, gym, tennis courts (racquets & balls provided), steam room, restaurant, day spa & hairdresser. It is conveniently located 100m from the Salamander Bay shopping centre and all the attractions of the bay are close at hand. To help you stay connected to the outside world free wifi NBN internet access is included. The townhouse is suitable for families, couples and groups. It caters for a maximum of 6 adults and cannot exceed 6 guests in total including babies. Due to strata regulations no pets are allowed. 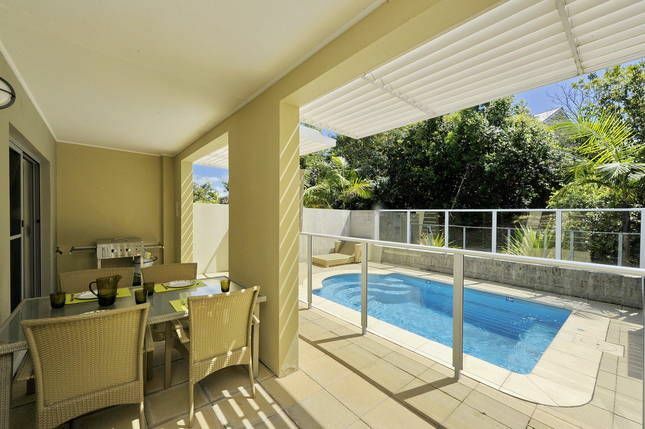 This townhouse is located in the Oaks Pacific Blue Resort but is managed by O'Meara Property, licensed real estate agents of Nelson Bay. As such it is not part of the resort letting pool and daily housekeeping is not included in the tariff. For your added security my agents never request payments be made to overseas bank accounts. The current guest has the first right to a booking for the corresponding period next year (subject to owner bookings) but must pay a deposit within 24 hours of vacating the property. As a consequence of this policy I do not accept bookings more than 1 year in advance. Please note that over the Christmas period check out or check in is not available on public holidays . Amazing cosy spaceish love 516 will be back for sure. The home has everything you need so modern clean we absolutely love it and will be back again. I'm so pleased to hear that you enjoyed your stay and you will be most welcome to stay anytime. I really appreciate you taking the time to leave your review thank you. Thank you for taking the time to leave your review. I'm so pleased that you and your family enjoyed your stay and I do hope you will come back again sometime. - The bathroom floors were dirty/dusty in all 3 places, when wet you'll see how dirty they were. - The showers had molds, it seems like it never been cleaned at all, the exhausts accumulated dust. - We found laundry in the washing machine unhung/undried. - The linen had stains especially on the pillows, the spare blankets were stinky. Hi Linda, I am sorry to hear that you were disappointed in the accommodation as most people enjoy their stay at 516 Pacific Blue and even come back as repeat stayers each year. The property should have been sparkling clean for your arrival and I am sorry if it was not. All of the problems that you mentioned have been checked and although the shower seals were replaced recently they are being replaced again today as even a small amount of mould in a bathroom is not acceptable. Thank you for your feedback, it is important to me as I strive to offer a great guest experience. We stayed here for our first wedding anniversary and 2 nights was definitely not long enough! This place is amazing! The resort itself is lovely and in a really beautiful area but Townhouse 516 was an absolute haven. At the end of our 2 day stay we were really sad to leave and will be definitely going back. Everything is provided, so apart from a little bit of shopping we had no need to leave if we didn't want to! The master bedroom was a really good size with King bed and balcony overlooking the pool with walk through wardrobe to the large ensuite. The main bathroom was enormous with a two person spa. Each bedroom has it's own aircon so even on hot nights you definitley won't be uncomfortable. The open plan kitchen/dining/lounge was a really good size so you didn't feel too cramped with plantation style shutters on both of the patio sliding doors so you could open them up for a pool view or keep them closed for privacy. The pool was lovely, and the deep end turns into a mini spa with the push of a button. Definitely recommend keeping the cover on the pool when not in use so that it stays heated. We will definitely be booking again, we loved our time there and were sad for it to end!